Sometimes there is nothing better than chewing a classic piece of gum. 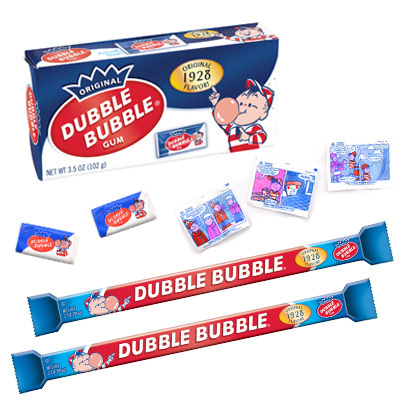 Dubble Bubble has fruit-flavored treats like Dubble Bubble Gum Balls to Dubble Bubble Cigars to celebrate the baby boy or baby girl, and the original 'twist' on gum, Dubble Bubble Twist Gum...a pink chunk of YUM. The iconic pink "chunk-shaped" gum, America's #1-selling twist-wrap gum is individually wrapped and available in a variety of tasty flavors. 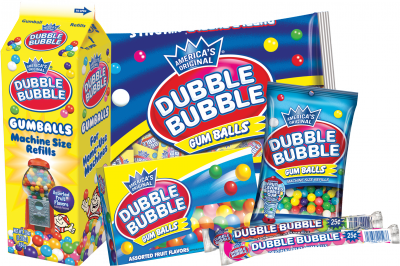 Candy Coated Dubble Bubble Gumballs are available in dozens of great flavors, including the very popular Strawberry, Blueberry, Lemon-Lime, Orange, Cherry, Banana, Grape, and Pineapple... just to name a few! Taste the distinct flavor of the original 1928 Dubble Bubble recipe! Be prepared to enjoy fun comics on every piece of gum. The original 1928 flavor is available in the nostalgic theater box and big bar forms. The iconic “chunk-shaped” gum, America’s #1-selling twist-wrap gum is now available in Sugar Free! 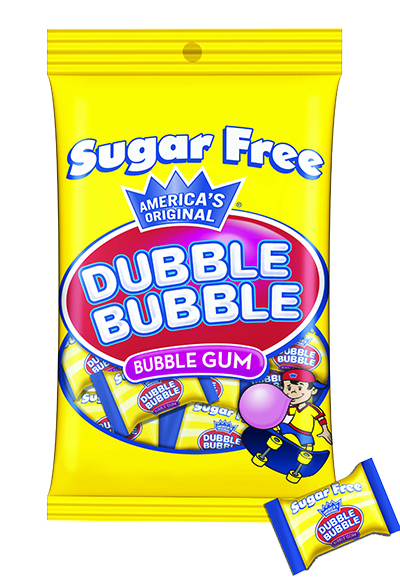 Our Sugar Free Dubble Bubble is individually wrapped, which means easy to share. Available in the classic, original flavor. Tasty Office Pleasures Chewing Gum comes is available in convenient, share-friendly jars, perfect for office desks or break rooms. The classic birth announcement cigars are available in “It’s A Boy” blue or “It’s A Girl” pink. These celebratory bubble gum favorites make the perfect special occasion, gift-giving treats. 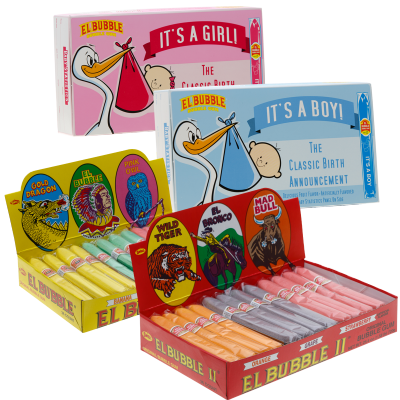 Available in a variety of multi-colored, fruity varieties - Dubble Bubble’s El Bubble Cigars, complete with cigar band, offer classic, cigar-shaped gum chewing fun for kids and adults of all ages. 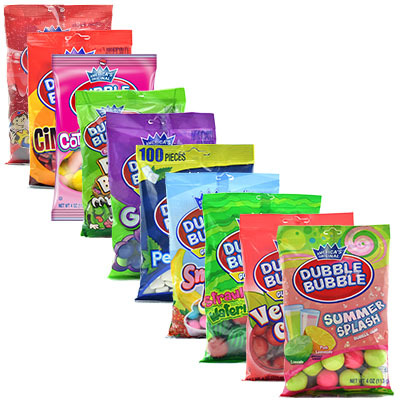 Dubble Bubble offers a wide variety of coated and uncoated dextrose bulk vending candy. Please download our bulk vending catalog for more complete information on products available and ordering. For more information regarding Dubble Bubble Bulk and Vending Candy ingredients and nutrition, check packaging. 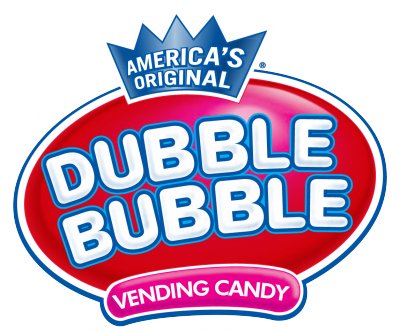 The same Dubble Bubble gum you love, in individual flavored bags and tubes. Find your favorite flavor!